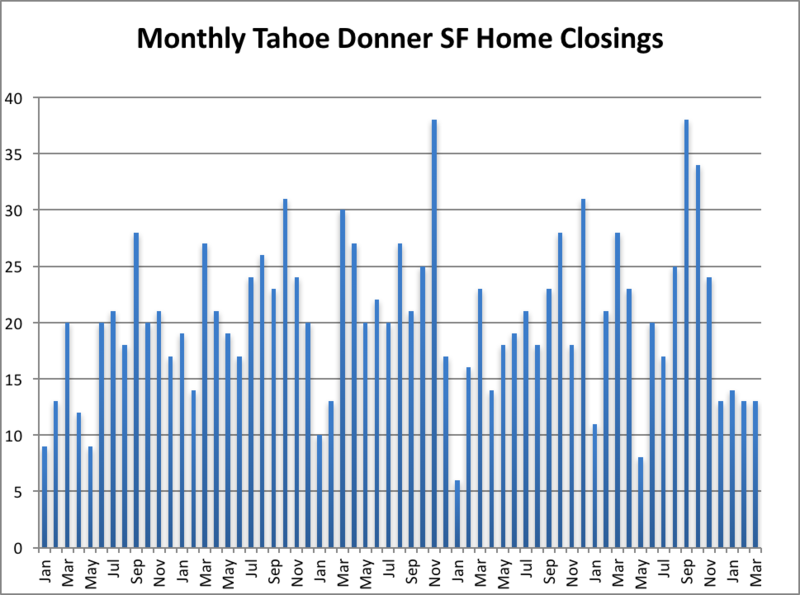 The following report shows Tahoe Donner Real Estate single family home sales activity for the last 5 years. 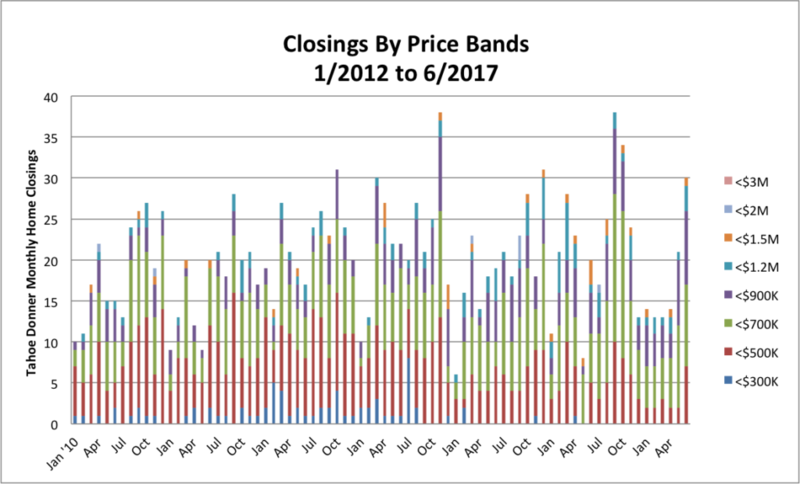 Data includes inventory levels, number of closings, average prices, days on market, sales seasonality, price bands for sales and comments about trends. Helpful information for buyers and sellers of Tahoe Donner homes. The data is obtained from the Tahoe Sierra MLS. Readers of this report are encouraged to work with a Real Estate Agent before making a buy or sell decision for a Tahoe Donner Home. In addition to sales data, buyers need to work with an experienced agent who knows what features are important for a Truckee mountain home. Tahoe Donner Real Estate is a great area to study for Truckee Real Estate Market activity. It has over 6000 homes and therefore presents a large database for meaningful statistical analysis. Tahoe Donner single family home prices vary from roughly $450K to over $1.5M and ages range from brand new to over 30 years old. Tahoe Donner is the largest and most popular housing development for Truckee Real Estate and approximately 75% of the homes are owned by second homeowners – the majority living in the Bay Area. Five soft months (Dec-Apr) followed by 2 stronger months (May, Jun) and 30 more homes contingent. July should be a strong closing month since there are so many homes in escrow that will close soon. No doubt that our above average snowfall snowed down housing activity. Days on Market of purchased homes was 79 days in Apr and 43 days in May and down to 22 days in Jun vs. a 5 yr average of 78 days – so, much shorter than average. Inventory of homes for sale dropping considerably – 76 in Apr, and 76 in May and 77 in Jun – vs. an average of 80. In addition, 3 brand new homes closed in Apr, May and Jun with 1 more in contract at Jun month end. Also, there were 5 active brand new homes for sale at the end of Jun. Jun was a bit unusual in that DOM for closed homes was 22 days while DOM for active listed homes was 57 homes – the conclusion here would be that buyers are focusing on new inventory. Note that sales for Tahoe Donner Real Estate are extremely seasonal and year-to-year comparisons are significant to get a valid picture of typical sales activity. 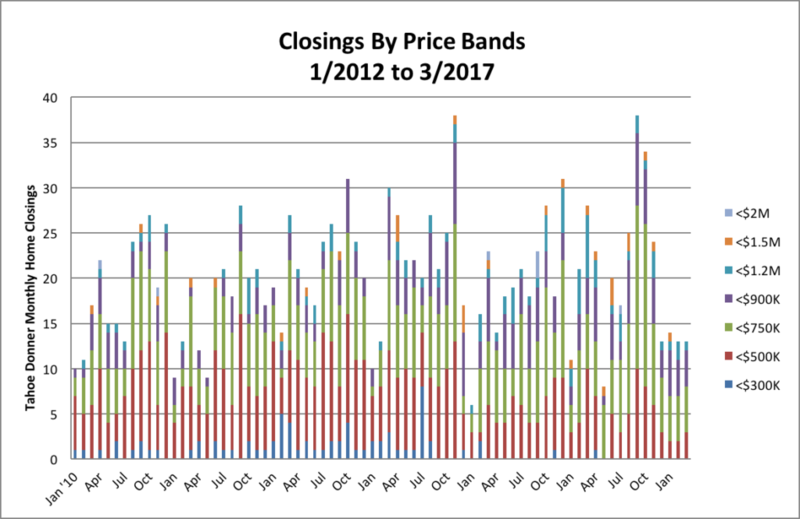 From a seasonality point of view, Jan-Feb is typically the slowest time of the year with closings increasing in Mar-Nov. Although this year Mar is softer than usual. The average number of closings for the last five years is 21 homes/month. Keep in mind the difference between closings and when the contract is signed, can be 4-8 weeks for close of escrow for standard sales and considerably longer for short sales and REOs. 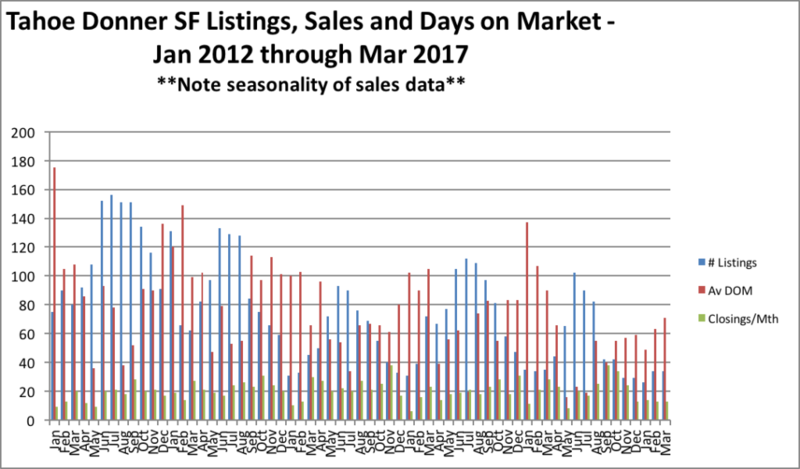 Looking at the following graph it is evident that listings are down over the last 5 years from 120’s down to the 70’s for the first half of 2017. Days on market has also come down for from the 100’s to the 60’s early this year. Closings were a bit slow (Fig. 2) from Dec through Apr – certainly due to weather issues. Would you buy what you can’t see under the snow? Average price is staying around $700K and the median was over $625K. A divergence in the average (aka mean) and the median is due to a distribution that includes more higher or more lower priced home sales. New Tahoe Donner home construction is back again with higher prices per sq ft. New home costs are up because of an increase in permit costs, tighter building specifications, fire sprinklers, energy conservation requirements, building material costs etc. At any rate, to sort out the present cost per sq ft, one must compare recent sales for like homes in terms of age, size, features and condition to determine the present market price. The recent increased sales of new homes and several higher priced homes have raised the price per sq ft favorably (Brand New homes are running roughly $325 to over $450 per sq ft). The average cost per sq ft for Jun was $336. Here’s a great graph for how the “mix” of homes sold can affect the average price. Note the large percentage of homes in the green < $700K range (less than $700K) and in the less than $900K range (purple band) and the jump in the less than $500K (red band) after several months of slow sales. Historic average sold to list price is approximately 96-98% of last listed price. It was 98% in Jun. Sales of homes priced between $300K and $500K (red) accounted for 33% of unit sales over the last few years. Homes priced between $500K and $700K (green) account for another 35% of sales. So, if you are shopping for a home in one of these price bands be prepared to move quickly on a home that you like – be pre-qualified and ready to purchase. 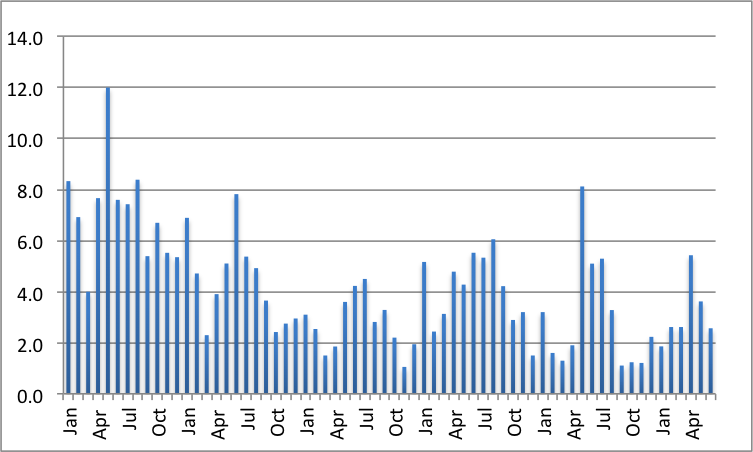 I’m introducing a new graph showing a “dynamic” months of supply for all homes – see Fig 6 below. This number is obtained by dividing the month end inventory of homes by the monthly sales. For example, if there were 80 homes available and 20 homes sold in that month the months of supply would be 4. The consensus is that 4-5 is typical – a smaller number like 4 or below tends to indicate a sellers market and a larger number like 6 and above would tend to indicate a buyers market. Supply for Sep-Dec were very low – we should see a pickup in supply around April as the ski season winds down. This graph is dynamic in that it uses the actual closings vs. the actual inventory for each month end instead of an average number of closings (20-21) for each month. 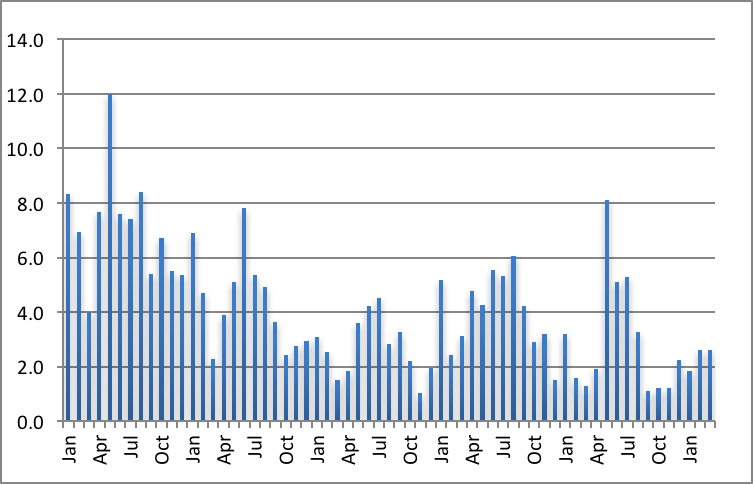 From the above graph, Dec through Jun months of supply was about 2 which indicates we are now in a sellers market. Clearly, this is primarily for the lower priced homes <$700K. The higher end homes above $1.2M tend toward a buyers market. Absorption rate is an inverse of this calculation in percent. Good News! 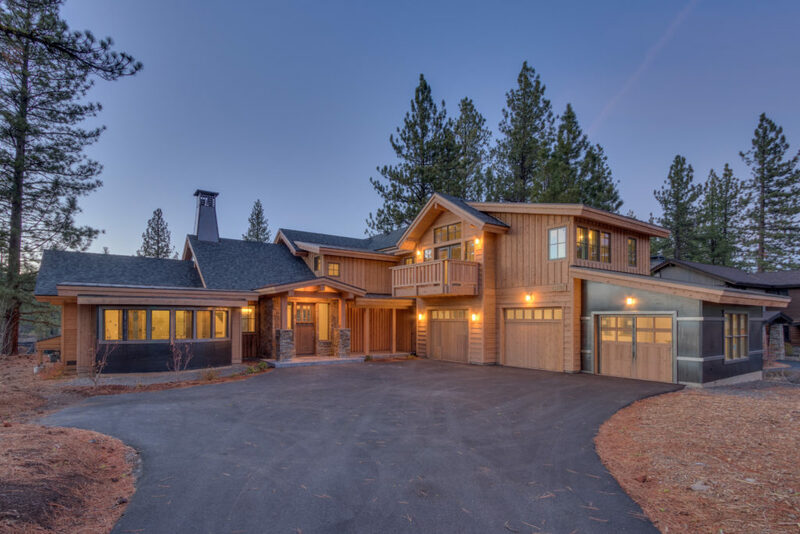 New Tahoe Donner home construction has picked up considerably in the last year – and many in the higher price ranges have been completed and sold. Contact me if you would like more information about the new construction. In Jun, 1 new home closed, 1 was contingent and 5 were active listings. 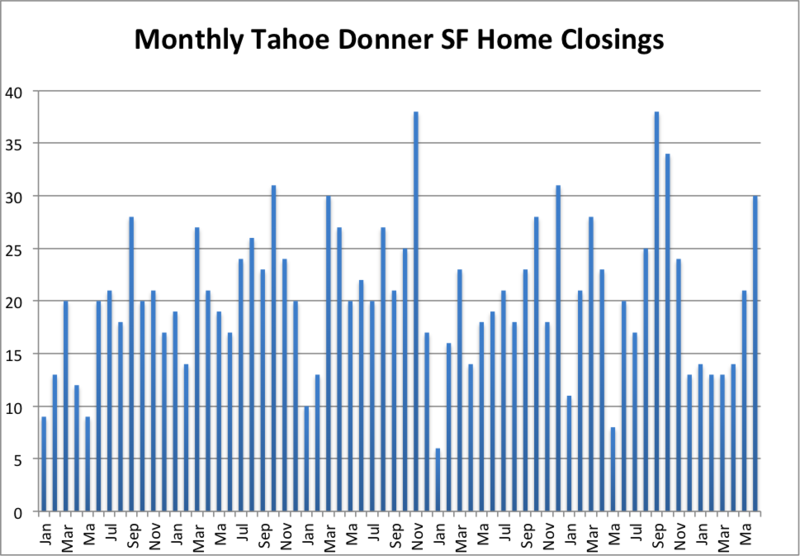 The Tahoe Donner Home market is strong – June closings at 30 homes were 50% over the average home closings. Contact me if you would like to discuss these results, see additional data or arrange an appointment to view or list any Truckee Real Estate. A new development in Verdi, West Meadows Estates, close to the CA border will have 323 homes built by D.R. Horton. They are one of the largest developers in the U.S. operating in 30 states and in recent years have been focusing on millennials. They are now grading the site and putting in utilities. 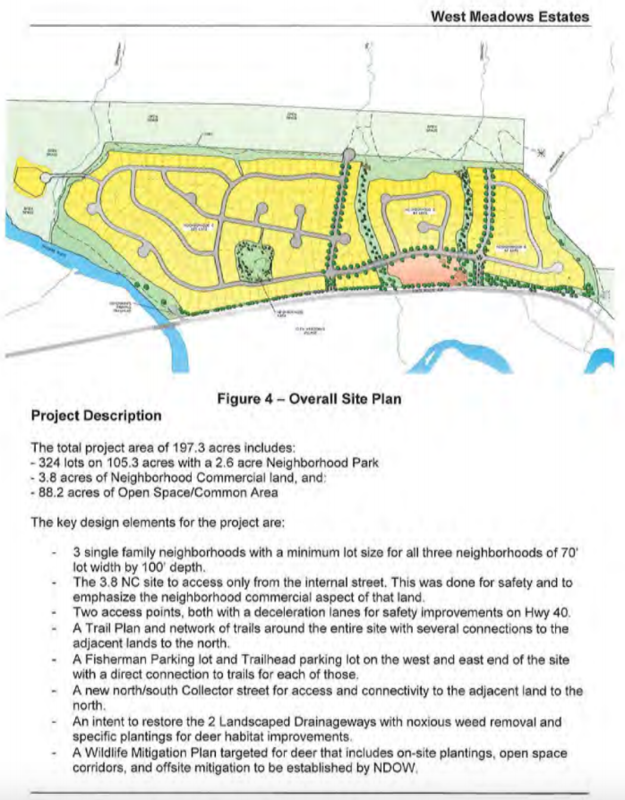 The homes will be a single story and vary in size from 1910 sq ft to over 3000 sq ft. They are hoping to have some homes completed by the end of 2017 but early 2018 is more likely. I am a licensed Realtor in NV and will be paying attention to this area – give me a email or call if you are interested in West Meadows Estates and I will send you additional information as I get it. 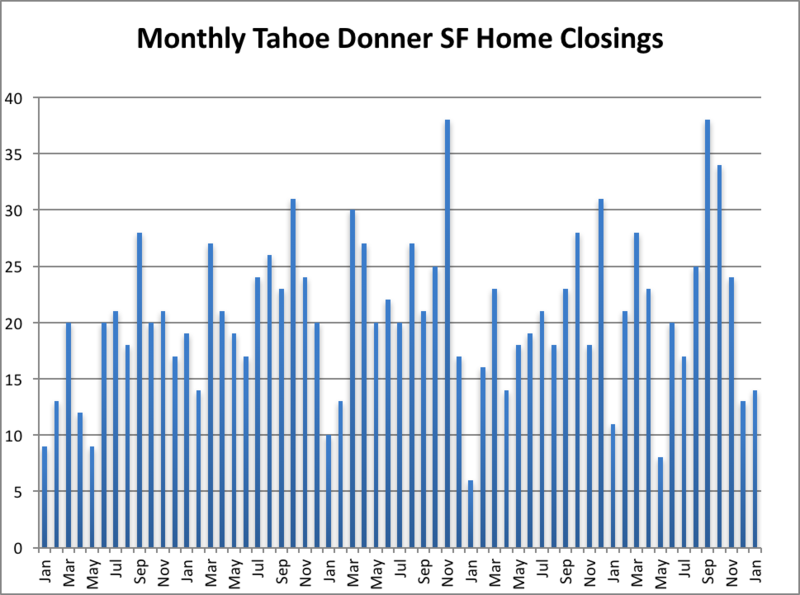 The following report shows Tahoe Donner Real Estate single family home sales activity for the last 5 years. Data includes inventory levels, number of closings, average prices, days on market, sales seasonality, price bands for sales and comments about trends. Helpful for buyers and sellers of Tahoe Donner homes. The data is obtained from the Tahoe Sierra MLS. Readers of this report are encouraged to work with a Real Estate Agent before making a buy or sell decision for a Tahoe Donner Home. In addition to sales data, buyers need to work with an experienced agent who knows what features are important for a Truckee mountain home. Tahoe Donner Real Estate is a great area to study for Truckee Real Estate Market activity. It has over 6000 homes and therefore presents a large database for meaningful statistical analysis. Tahoe Donner home prices vary from roughly $300K to over $1.5M and ages range from brand new to over 30 years old. Tahoe Donner is the largest and most popular housing development for Truckee Real Estate and approximately 75% of the homes are owned by second homeowners – the majority living in the Bay Area. A couple of soft months following 2 additional soft months. 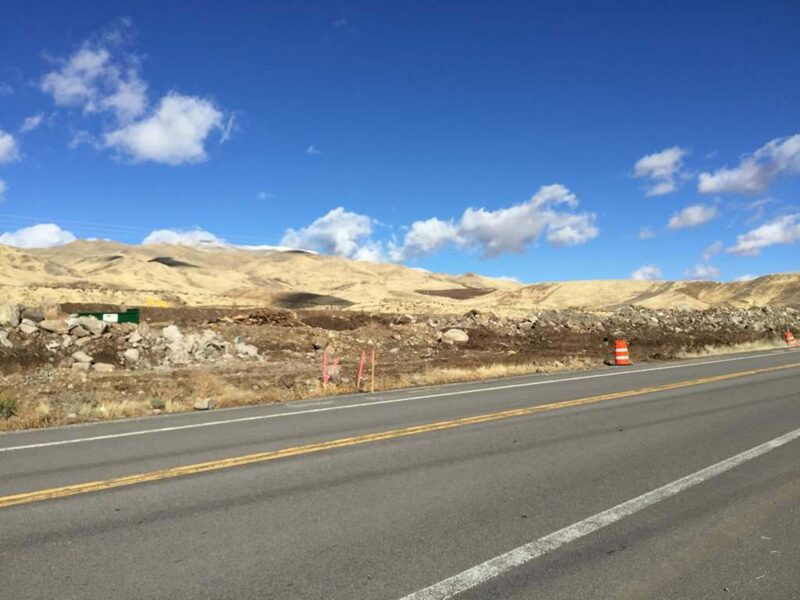 My opinion is that more of the higher end sales are happening in Gray’s Crossing, Schaffers Mill and Lahontan. Days on Market was 63 days in Feb and 67 days in Mar vs. a 5 yr average of 78 days – so, a bit shorter than average. Inventory of homes for sale was low – 41 in Feb and 41 in Mar – vs. an average of 80. So, with an inventory of 50% of the average it is clearly a sellers market. 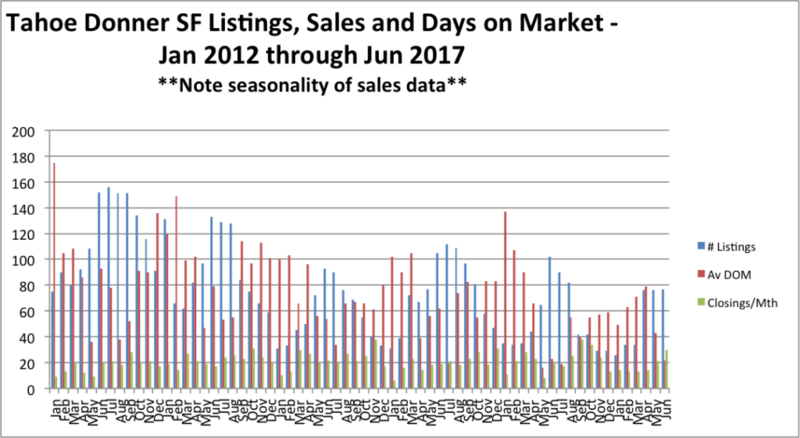 As we get more into the Tahoe Donner Real Estate spring season, seasonality graphs indicate that inventory will pick up again. Also 3 of 41 active listings are new homes with list prices of $1.235M to $1.375M – considerably above the $700K or so average prices that Tahoe Donner Homes are selling at. In addition 3 brand new homes closed in Feb and Mar with 2 more in contract at Mar month end. 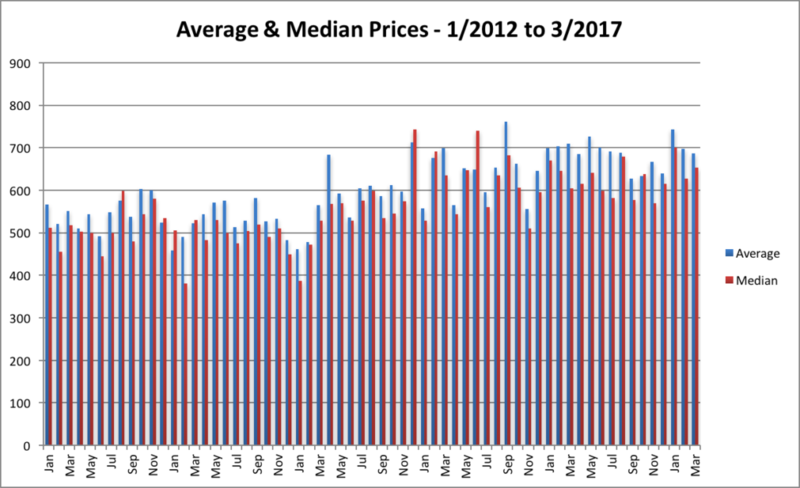 Average price for Feb was $699,000 and the median was $625,000. 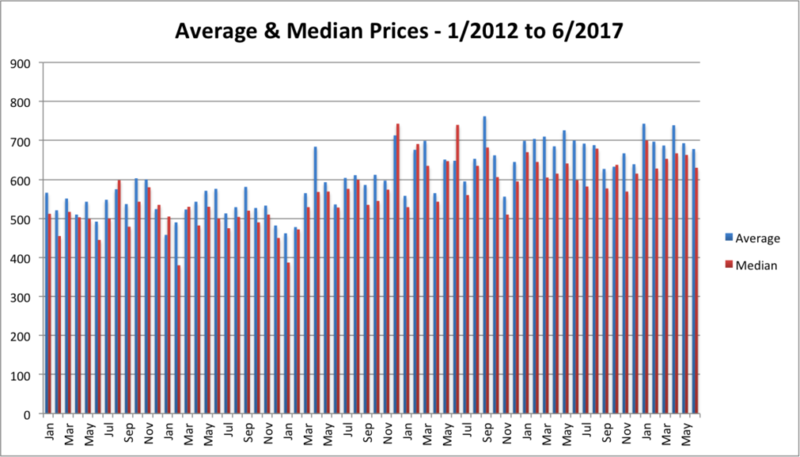 A divergence in the average (aka mean) and the median is due to a distribution that includes more higher or more lower priced home sales. The average price is around $700,000 which is up considerably in the last few years. New Tahoe Donner home construction is back again with higher prices per sq ft. New home costs are up because of an increase in permit costs, tighter building specifications, fire sprinklers, energy conservation requirements, building material costs etc. At any rate, to sort out the present cost per sq ft, one must compare recent sales for like homes in terms of age, size, features and condition to determine the present market price. Feb had 26 active homes for sale at the start of the month with 6 of the 26 being brand new homes above $849K asking price and 4 of the 6 being above $1M – so look for a higher average when these homes sell. The recent increased sales of new homes and several higher priced homes have raised the price per sq ft favorably (Brand New homes are running roughly $325 to over $400 per sq ft). The average cost per sq ft for Feb and Mar was $321 and $344. Jan was $323. Here’s a great graph for how the “mix” of homes sold can affect the average price. Note the large percentage of homes in the < $700K range (less than $700K) and in the less than $900K range (purple band) and the small number less than $500K (red band). Historic average sold to list price is approximately 96-98% of last listed price. It was 97% in Jan, 98.7% in Feb and 96.7% in Mar. Sales of homes priced between $300K and $500K (red) accounted for 34% of unit sales over the last few years. Homes priced between $500K and $700K (green) account for another 34% of sales. So, if you are shopping for a home in one of these price bands be prepared to move quickly on a home that you like – be pre-qualified and ready to purchase. 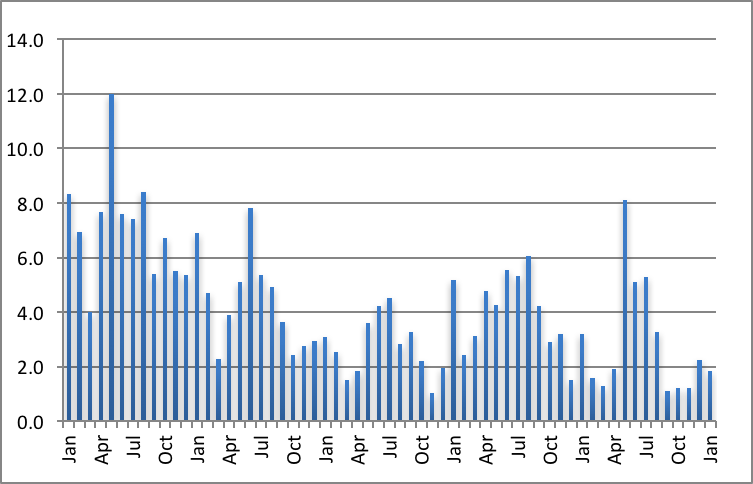 I’m introducing a new graph showing a “dynamic” months of supply for all homes – see Fig 6 above. This number is obtained by dividing the month end inventory of homes by the monthly sales. For example, if there were 80 homes available and 20 homes sold in that month the months of supply would be 4. The consensus is that 4-5 is typical – a smaller number like 4 or below tends to indicate a sellers market and a larger number like 6 and above would tend to indicate a buyers market. Supply for Sep-Dec were very low – we should see a pickup in supply around April as the ski season winds down. This graph is dynamic in that it uses the actual closings vs. the actual inventory for each month end instead of an average number of closings (20-21) for each month. From the above graph, Sept and Oct months of supply was about 1 which indicates we are now in a strong sellers market. Clearly, this is primarily for the lower priced homes <$700K. The higher end homes above $1.2M tend toward a buyers market. In Feb, 2 new homes closed, 2 were contingent and 3 were active listings. In Mar, 2 new homes closed, 2 were contingent and 3 new homes were active. Not an April Fools Joke – It’s Happening! Directions: Hwy 89 North from Interstate 80. Stay on Henness Rd for 1/4 mile and open house will be on left side. The Price for 11575 Henness Rd has been adjusted to $1,699,000 from $1,749,000. This is a 3619 sq ft golf course home on the 1st fairway with 4 en-suite bedrooms featuring cathedral ceilings, 3 car garage, fine finishes, 2 fireplaces, outdoor fire pit, media room, mud room, loft, upstairs playroom, 2 balconies off bedrooms, chef kitchen, 3 zone high efficiency heating with nest controllers, 2 tankless water heaters, alarm system and LED lighting throughout home. Gray’s Crossing is a beautiful area to live with mountain and golf course views and contains a golf course, PJ’s Restaurant, Exercise Area, Pool, Bocce Ball Court, Golf Driving Range and walking paths throughout the development. Homeowners also have the option of joining the Tahoe Mountain Club for additional amenities and social events. Clearly, one of the nicest areas to own Truckee Real Estate. At the present time there is a significant amount of new home building activity in Gray’s Crossing. Days on Market was 49 days in Jan vs. a 5 yr average of 78 days. 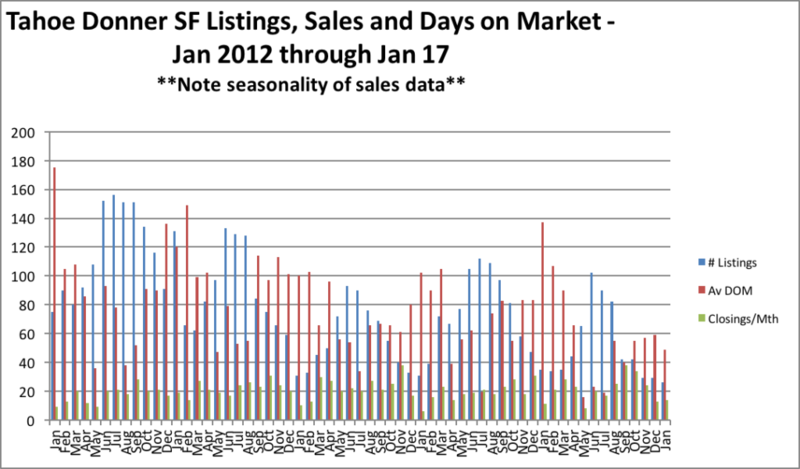 Inventory of homes for sale was low – 26 in Jan, 29 in Dec. and 29 in Nov – vs. an average of 80. The record 72 closings in Sep-Oct clearly took out some inventory that was not replaced. So, with an inventory of 33% of the average it is clearly a sellers market with slim pickings. As we get more into the ski season, seasonality graphs indicate that buying will pick up and inventory will drop further until spring, at which time inventory will pick up again. 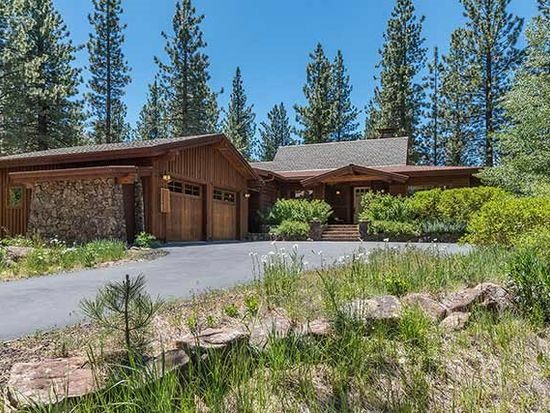 Also 6 of 26 active listings are new homes with list prices of $849K to $1.375M – considerably above the $700K or so average prices that Tahoe Donner Homes are selling at. In addition 1 brand new home closed in Jan with 3 more in contract at Jan month end. Note that sales for Tahoe Donner Real Estate are extremely seasonal and year-to-year comparisons are significant to get a valid picture of typical sales activity. 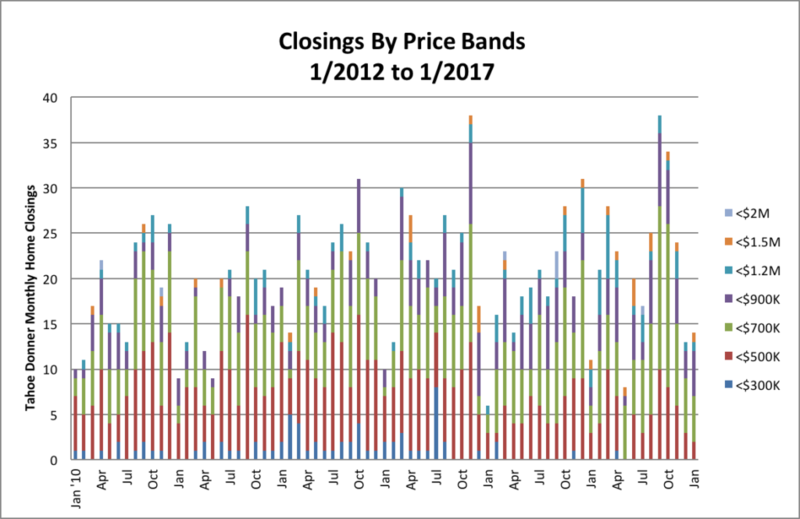 From a seasonality point of view, Jan-Feb is typically the slowest time of the year with closings increasing in Mar-Nov. The average number of closings for the last five years is 21 homes/month. Keep in mind the difference between closings and when the contract is signed, can be 4-8 weeks for close of escrow for standard sales and considerably longer for short sales and REOs. 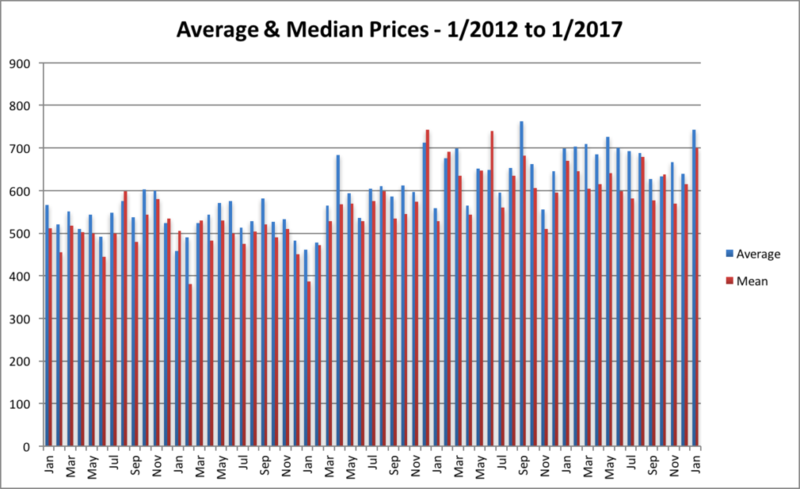 Average price for Jan was $743,000 and the median was $700,000. A divergence in the average (aka mean) and the median is due to a distribution that includes more higher or more lower priced home sales. The average price is slightly below $760,000 which was a 5 yr high back in Mar 2014. This is certainly due to lack of lower priced inventory available for sale. The average cost per sq ft for Jan was $323, Nov and Dec was $317 and $311. Here’s a great graph for how the “mix” of homes sold can affect the average price. Note the large percentage of homes in the < $700K range (less than $700K) and in the less than $900K range (purple band) and the small number less than $500K (red band). Historic average sold to list price is approximately 96-98% of last listed price. It was 97% in Jan. In Jan, 1 new home closed, 3 were contingent and 6 were active listings. In Dec, 1 new home closed, 2 were contingent and 8 new homes were active.